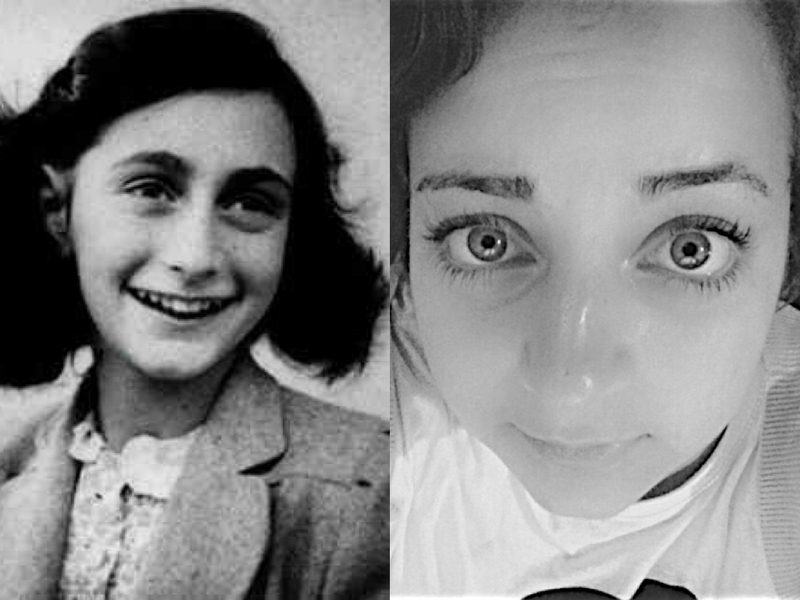 At the age of thirteen Anne Frank received a gift from her father that she had seen in the window of a shop. That book became her diary documenting her life under the rule of the Nazi’s. Two years later she died in the Bergen Belsen concentration camp, and her diary became one of the most famous references to the holocaust, and what Jews living under Nazi rule had to endure. Farah Baker is a sixteen year old girl living in Gaza. She has been tweeting and blogging about her life since 2012. One of her latest tweets posted with a photo of numerous air strikes happening around her reads, “This is in my area. I can’t stop crying. I might die tonight.” Two days ago Gaza’s only power plant was targeted by the strikes, leaving its inhabitants without electricity. No computer’s, no wifi machines, no cell phone charging. That might be Farah’s last word, only one year older than Anne’s, yet must she have the same fate for her voice to be heard? Must there be two diaries that fell on deaf ears? Empath’s are people with the ability to understand the mental or emotional state of other individuals. They are finely tuned, able to understand the energy surrounding them, finding themselves overwhelmed in the most intense of situations. Empathy is human, but an Empath is much more than that. They absorb the feelings of others and are able to relieve suffering. They are not supernatural beings, we are surrounded by them. They are the people that listen to us and help us through our problems. They are our emotional guardians. They are even our most famous examples; Mahatama Ghandi, Martin Luther King, Harvey Milk, Mother Teresa and the list goes on. Behind every great moment of humanity in our history there was an empath. They destroyed slavery, apartheid and the holocaust. They put their fear of death aside and gave their lives to the liberation of the oppressed, but they could not do it alone. The question of what it is to be human is one that has haunted us for as far as we can trace in our evolution. The first work of literature ever published dating back more than two thousand years was, “The Epic of Gilgamesh”. A story about a king, two thirds God and one third human who is oppressing his people and in answer to his people’s prayers the God’s send Enikdu to kill him. They fight but then become friends and Gilgamesh is transformed by his love for Enikdu. When they cut a sacred tree together after killing the beast guarding it, Enikdu is plagued with an illness that kills him. Gilgamesh heartbroken starts to ponder the prospect of his own mortality and sets out to find the secret of eternal life, learning in the end that immortality is in what you leave behind. Socrates, Newton and Einstein will never die. But neither will Genghis Khan, Henry VIII and Hitler. We have been asking ourselves what it is to be human and although we had it right two thousand years ago we still allowed the mass massacres hiding behind irrational reason, and etched in our history one eternal tragedy after the other. The more I look at my news feed the sadder I become at the state of our world. It is said that we are at the peak of our evolution but all I see is history repeating itself. Slavery is in the people harvesting Cocoa in the Ivory coast and weaving carpets in India, working all day for a dollar. Apartheid is in the separation barrier between Israel and Palestine. I have been silently watching the atrocities of today’s world, nicely protected in my bubble, but now I am witnessing another holocaust. The isolation of a people into a land so small that it is the most densely populated place on Earth. The establishment of “no-go” zones 3 km away from the fence displacing 250,000 people. The relentless dropping of newly developed bombs with disregard for schools, hospitals and sanctuaries. And perhaps the most shocking of all, the support of the most powerful nations in the world. My empathy is bleeding me to my core, and my silence has become a form of participation. I prided myself in being a first world human, but now I am ashamed to belong even there. I do not want to be part of that legacy, it is not who I am. I am of love. I am of peace. I am of abundance, just like you. And we are many, we are the world itself. We are those screaming humanity in the streets of New York, London, Barcelona, Dublin, and Beirut. We are those that have purged a propaganda of lies spewed by our media. We are beyond tales of persecution that have shielded where it truly exists. We are the generation of empaths born of a past of those who stood, the cosmic balance to those who didn’t, and we will nurture it in ourselves and in our children, and in our children’s children until we are the history book of humanity. They may strip me until there is nothing but my skin to bare, and my tears to weep. But there is a sun in my soul that penetrates deeper than they can ever reach.